There's no question that this weekend's Colgate and Lehigh game is an enormous game for both sides. There's also a bit of a quarterback "controversy" on the Lehigh side as to who will come out for the first series, award-winning sophomore QB Brad Mayes or award-winning senior QB Nick Shafnisky. One thing that has gone a bit unnoticed is the impact of Hurricane Matthew on the game this weekend. Not so much the impact of the southerly weatherly system on the weather at Murray Goodman, which is still on target for a mostly cloudy, 65 degree day, with a small chance of showers in the late afternoon, but the impact on the Lehigh and Colgate players, many of whom call Florida their home. Added to the already-challenging coaching twists centering around 4 O'Clock exams, something that head coach Andy Coen reminded me of last week, is the concern that the fourteen Lehigh football players from Florida, including Mayes, senior LB Colton Caslow, junior WR Gatlin Casey and a bunch of others, have for their families back at home. Overall, seventeen Lehigh football players (14 from Florida, 3 from Georgia) and sixteen Colgate football players (15 from Florida, 1 from North Carolina) have family and possessions potentially impacted by Hurricane Matthew. You can't blame some of those athletes being a bit distracted if they have a bit more on their minds than just football. With evacuations being ordered for some folks in the way of the storm, Andy has said some players have been concerned for their families. Additionally, Lehigh sports information director Steve Lomangino said that the athletic department can "help out as needed" for some situations as well. In the past Lehigh football games have had collection tables at Lehigh football games to solicit donations for hurricane relief, though it might be too early to set something like that up for this weekend's game. Also looming over the proceedings was a scary hit involving junior CB Quentin Jones, whom coach Coen described as "one of the best, if not the best, defender we had." Senior linebacker Colton Caslow was the closest Mountain Hawk to the scene. He immediately waved for trainers after seeing Jones face down in the grass and hardly moving. "His neck kind of went the wrong way," Caslow said. 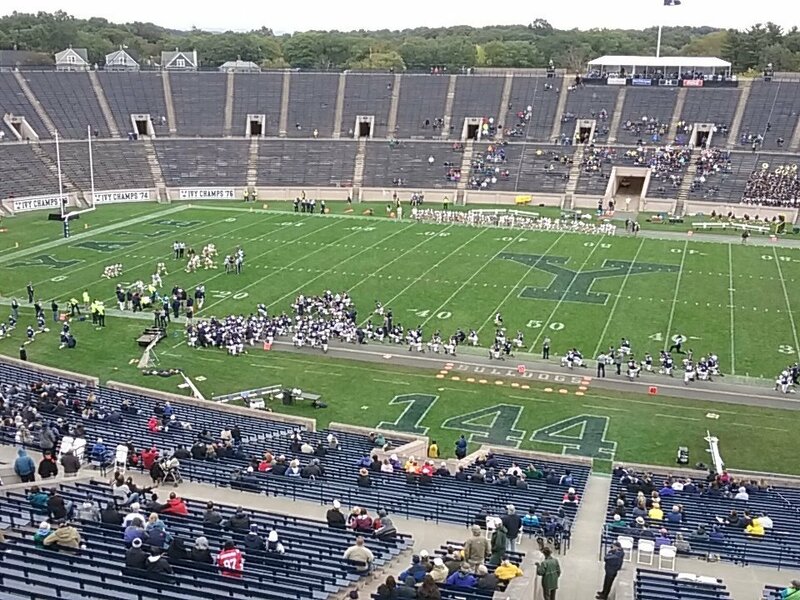 A hush fell across the Yale Bowl as the medical staff from both teams tended to Jones. The Mountain Hawks had been enjoying a big day on the way to a 63-35 win, but this stopped them all in their tracks. "It was scary, man," head coach Andy Coen said. After that scary hit, when they did come back on the field, Caslow got back up on the horse in a big way, stuffing a Yale running play on a tackle for loss. But after that, both sides sort-of let up a bit, doing what was necessary and finishing out the game. There was some good news this week in regards to Quentin's situation. "We believe that Quentin is going to have a full recovery," Coen said. "That's pretty much where we're at. It's very positive." And although it will be without a teammate, Lehigh plans on taking the field with Jones in its heart and mind. "It always (stinks) when you have a guy go down, but it adds that extra sense of why we play the sport," Caslow said. "Who are we going to play for? Obviously we have a reason now. We can play for 'Q.'" Is the injury, 4 o'clock exams, and possible hurricane impacts going to affect the emotion levels of the Mountain Hawks going into this weekend? "As we're getting into league play, I think the kids are going to be sky-high," Coen told me. "If anything, we need to caution against getting too intense. The best teams are kind-of level, and then they spike when they need to. The kids are great. I think we're pushing the right buttons for these guys, and they're loving it. They are really, really excited about it." "We're just executing at a higher level right now and have eliminated the mistakes we were making," Casey told Keith Groller of The Morning Call. "Both Nick and Brad are great quarterbacks who can both put the ball on the money and both can run. They're both great leaders who can take control of the huddle. We have faith in either one." "We're coming in with a three-game win streak and everyone's feeling confident and the energy is through the roof," Caslow added. "With Colgate coming in, it's like a championship game in Week 1 of the league. We're hoping to bring the heat and get after them. They're a good offense, and they know how to execute their gameplan really well. They make very few mistakes, and we just need to hang in there and get on top early." In addition to the players and print media, there were four great videos by Campus Insiders that are also worth your time featuring Andy Coen and Colgate head football coach Dan Hunt (and a whole lot of fun highlights, too, that are worth reliving).